I wrote most of the following thoughts last Fall when Aunt Neta asked that we document some of our memories of Mark. I was on a flight from the west coast, thinking of how Mark must have loved to fly above the clouds where the sky is so blue. Here it is months later and I'm just now finishing it. I think, perhaps, that I just didn't want to get to the ending. I still think of Mark quite often. Although I didn't see much of him as an adult, I feel he was the cousin I knew the best. 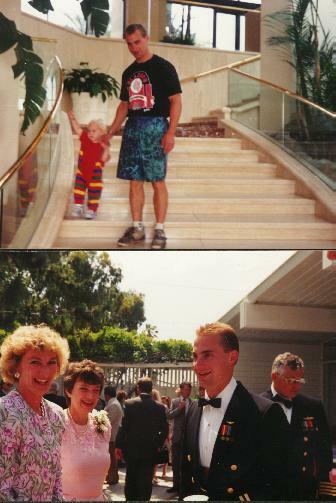 I vaguely remember Mark as a toddler during our Colorado vacations. I do recall a slight feeling of jealousy at first because he was so young and cute that he stole some of the attention away from me, since I was no longer the youngest boy cousin. As time went on though, he became more of a "partner of mischief' at 608 S. Meldrum, as the clan of cousins grew larger. We had to do something while David and Larry played chess, and Linda and Patty were together. So ... we picked on Barbara, Kelly and Becky. Mark and I would booby trap the basement doors, or lure them downstairs to scare them. Outdoors, I recall playing freeze tag or kick the can, and later, croquet. We also liked to explore the garage and especially the loft above it. Even in the early days we all liked to play volleyball. Who can forget the photograph with Mark and Barbara's bulging tummies that we dubbed 'Who's got the volleyball?" One summer, our family drove to Portland to visit. We went out on Uncle Stan's boat with everybody, which was perhaps my first ride on a motorboat. Mark told many fish stories in the years to come, and I always visualized him fishing from that boat. I'm not sure if he was collecting lost golf balls at that young age but he apparently became quite an entrepreneur at the nearby golf course. Speaking of fishing, I remember one time when all the Parsons/Sharps camped in primitive shelters at Yosemite. Mark and I decided to take the shuttle bus to fish at one of the the lakes. When we tried to get on the bus with all our gear, I jumped on, only to realize that there was only enough room for one of us. The bus took off without Mark. I rode to the lake at the top and waited awhile but Mark never appeared. Since I was the older one, I felt responsible for losing my cousin so I took the next shuttle down the mountain. He wasn't back at the camp so I continued riding the shuttle until I finally ran into him. He said that he had decided to fish at one of the lower lakes, had caught a nice sized trout, and oh by the way, he wasn't worried at all about getting separated from me! Typically when at these National Parks, we would split into two hiking groups - short and easy versus long and difficult (made even longer by Uncle Stan's frequent conversations With strangers). Even when Mark was barely old enough to go on the long hike (or so they thought), he would insist on it, and have no problem keeping up. On one such hike, we saw a bear with cubs at the stream that we cautiously crossed. On another one of our neat vacations, we stayed in cabins at the Grand Tetons. While we were getting ready to go somewhere, Mark and I were outside in back of the cabin throwing rocks up on the roof of the cabin. One time, a large rock sailed over the roof and hit Uncle Bob's blue Catalina as he and Dad were standing right next to it. We (I) had been caught red-handed (sorry Bob). We also went fishing on this trip, but after getting up early we were disappointed to find out that the stream was about the size of a small drainage ditch. I don't think my brother David ever fished again after that. As we got older, during our summer vacations in Colorado we were able to take advantage of the activities available at the College Inn such as the football table and outdoor swimming pool. Naturally, races in the pool With Mark were inevitable. Ping-pong in the basement was also a challenging match. Every summer in Colorado we went through the annual ritual of driving up to the mountains for a hike. I would sometimes ride with Stan, Neta and Mark. One time we even bought a Peugeot on the way up. Even at his young age, I could tell Mark was interested in all the right questions and answers that typify the consummate educated buyer that he became. Now I know where Mark got his trait of loyalty to particular companies or brand names (e.g. cars, skis, etc.). Uncle Stan swore by Peugeots ... whether they started or not. Once during a Winter visit to Colorado, we all pushed the car into the garage and placed oven-heated bricks under the diesel engine to start it. Before the Peugeots, the Sharps would come to Colorado in their Volvo. Later, Mark told me he was restoring the car, if he could only get it to pass emissions inspection. I think he was just such a conservationist that he couldn't bear to see the car scrapped. Mark loved to ski. At least twice, we all congregated in Colorado for a Winter vacation so that we could ski. Mark was always anxious to get to the slopes, then would ski all day practically without stopping. He insisted on top notch equipment too. One year, I went shopping at Gart Bros. with him when he very carefully picked out a set of orange boots. Unfortunately the boots had a problem the fool[owing season but they couldn't be returned. Boy, was he upset! We also had fun during the winter vacations ice skating at the outdoor link at the college. Everything he made had to be of the highest quality. He told me about the soapstone wood stove that he made in High School and was obviously very proud of. This stove apparently was the biggest, heaviest and best there was (just like the fish he caught). It was air tight, had a lot of 'thermal mass", ...and couldn't be moved by anything less than a forklift truck. 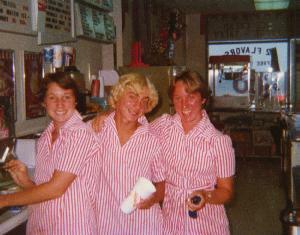 During the summers of 1977 and 1978, Mark came east to work at our family's ice cream parlor at Rehoboth Beach, Delaware. We shared a bedroom during that first summer. Mark never liked the muggy weather in the East. He frequently contrasted the overcast skies in Delaware to the clear blue skies of Oregon. Of course, he neglected to tell me about the 100 days of rain that they get per year, but ... perhaps he was just a little bit homesick (one morning, he called his mom presumably just to get her recipe for pancake puffs). Actually, until he pointed it out to me, I didn't really notice how rare the blue skies are during summertime at the beach. In addition to our beach house at 43 1/2 Baltimore Avenue, there were five girls that were friends of our family that stayed just two doors away, at 39 1/2 Baltimore. We had 'imported' a couple of them from Newark to work in the ice cream parlor. As a result, there always seemed to be something to do. For instance, one of the local guys whose family had a boat would occasionally invite several of us out to go water skiing. Needless to say, Mark loved to water ski and would do whatever he could to get out on the boat (e.g. bug him, drop hints, change his work schedule). Since the girls at 39 1/2 Baltimore were so close, they became a natural target one day when Mark and I decided to launch bottle rockets from our porch to theirs. The first one was a perfect shot that exploded right outside their screened porch at about ear level. Mark was evidently on the soccer team in Portland, so he brought with him a soccer ball to practice with during the summer. Kicking the ball around looked boring to me since soccer wasn't very popular in our area at that time, but Mark would go down to the beach or the park to practice his dribbling. Regardless of what sport it was, Mark always seemed willing to spend the extra effort practicing in order to perfect his skills. I can still visualize him doing his daily sit-ups in the living room with 'mud' on his face to clear up his completion. Perhaps his body building paid off, because as time wenton, there appeared to be more and more girls hanging around the ice cream parlor when he worked. However, it never interfered with his strong work ethic at the shop. During the summer of 1978, 1 married one of those 'girls' (Kathie) from 39 1/2 Baltimore. We moved to upstate New York, then in the coming years to West Virginia and Pennsylvania. As a result, I didn't see much of Mark again, other than during summer vacations in 1981 and 1982 after Grandma and Grandpa Parsons had moved to their condominium. 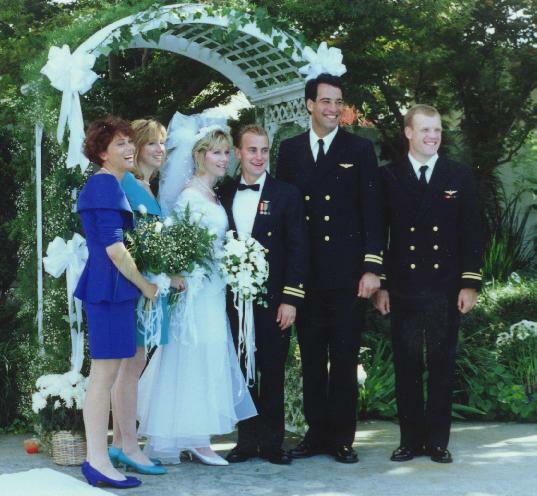 Of course we are all proud of how Mark progressed in the Navy, although it's not surprising that once he set his mind to it, he was able to achieve his goals. He did Whatever it took through practice and determination. I know I've told many people over the years that my cousin is just like the 'Top Gun', which is only bestowed on a few individuals who make it that far. Last summer (July 1994), it looked like I was going to see Mark again for the first time in over ten years. He happened to call Mom and Dad's house in Colorado early in the week while my family was there on vacation. He said he was flying a training mission from Virginia Beach to Cheyenne and would like to stop in and visit for a day or two. He was hoping to fly on Friday, so we reserved a golf tee time for early Saturday morning. However, he called that Friday afternoon to say that due to bad weather in the Midwest, he would not be able to come. Mom and I talked to him on the speaker phone in the kitchen; about the sack of Mississippi oranges he was bringing for Mom, about the jewelry pouches he was bringing for Grandma to sew, about his new golf clubs, and of course, about his home brew. During a previous trip, he had left three bottles of his homemade beer and one bottle of bottled coffee (his idea for his next money maker). During the week I had tested two of the bottles, a Silver Dollar ale and a Dunkel ale, Which were both excellent. I thanked Mark for leaving them and told him about how I had been wanting to make my own, but never had. Before hanging up, I wanted to be sure he had our current address and phone number, but he suggested I give it to Gaily, saying "She takes good care of me". We told him that my sister Barbara was pregnant and he seemed very excited, ensuring that we tell her 'congratulations', just before we hung up. The following evening, Kathy and I went to Denver to visit an old college friend of mine, Jeff. Before leaving for Denver, I went to the refrigerator to take the last bottle of Mark's beer with me to Jeff's. There was one bottle with an unlabeled cap (presumably the bottled coffee) and one which said 'real beer'. Naturally, I grabbed the 'real beer' to take to Jeff's. After dinner, I told Jeff how excellent Mark's beer was, and that he had even won a national award recently. Of course he was anxious to try it, so we poured the bottle into glasses, and I watched as Jeff took the first sip. Much to my surprise, Jeff was speechless, and looked like he wanted to spit it out in the sink! I had brought the bottled coffee by mistake rather than the beer. We had a good laugh from that once we realized what had happened. I still wonder whether Mark put the 'real beer' caps on the coffee in hopes of fooling someone. That would have been typical of his style. When Kathie and I got home to Loveland that night, we were told the devastating news that Mark had died in an accident that day while taking off from Virginia Beach to go home to Mississippi. In a way I felt cheated that I hadn't seen him in recent years, but in looking back on the week prior to his death I feel like I was in touch with him, and that I still knew him well; through his homemade beer that I tasted, through the golf tee time that we made for all of us, through the excitement in his voice over the phone, and finally through the prank that he played on us in mislabeling the bottled coffee. He had said good-bye. Due to Mark's inspiration, I made my first batch of home brew in September. Just as he would have done, I took great care to use the highest quality ingredients. I started the batch from liquid yeast ("not for beginners'), I followed the directions rigorously, I made absolutely certain the bottles were sterilized, and the result was a batch that even Mark would have been proud of - perfect. I realized that even after his death, he had motivated me to do the best job that I could. He had influenced and contributed to the outcome of my home brew, and the same analogy can be made for all those Whose lives he touched. There is a part of him in the personalities that we've adopted. Since he wouldn't settle for second best, we were all challenged to perform better which has raised our expectations and achievements in life. Thank you, Mark..
At Mark's funeral service in Meridian, Mississippi, hundreds of people turned out to pay their respects. In composing my thoughts of what to say about Mark, I was somewhat nervous and intimidated by all the people in the church. However, when I got up to the podium to deliver the following eulogy, I felt an overwhelming sense of calm, as if Mark wanted me to tell the congregation about how he would like to be remembered. "As Mark's cousin, I spent many summer and winter vacations with him. I remember Mark as always wanting to go out and do something. He would say 'Let's do this', or 'Let's do that', whether it be swimming, fishing, hiking, skating, skiing, or whatever. He was not content to sit still. And Mark would not just want to do things, his approach was that he had to excel at it. He always strived to be the best. He was always challenging me to do better at the things that we did together ... challenging me in a competitive, good sportsmanship way. As a result, I performed better and developed a similar drive to succeed. "In looking for something good to take away from this, I know what I'm going to do, and I invite all of you to do the same. That is, to renew our commitment to approach everything we do with the same intensity, excitement, and tenacity that Mark did.